U.S. Department of State, Bureau of Oceans and International Environmental and Scientific Affairs, Limits in the Seas, “No. 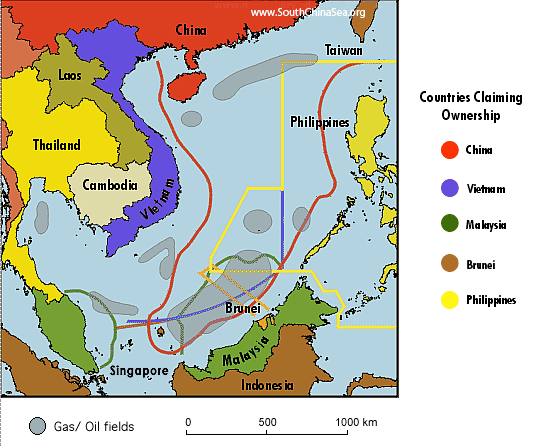 143 China: Maritime Claims in the South China Sea,” 5 December 2014. Jeff Himmelman, “Game of Shark and Minnow,” The New York Times, 27 October 2013, http://www.nytimes.com/newsgraphics/2013/10/27/south-china-sea/. Council on Foreign Relations, “China’s Maritime Disputes,” http://www.cfr.org/asia-and-pacific/chinas-maritime-disputes/p31345/#!/. The New York Times, “Territorial Claims in South China Sea,” http://www.nytimes.com/interactive/2012/05/31/world/asia/Territorial-Claims-in-South-China-Sea.html. Permanent Court of Arbitration, “The South China Sea Arbitration,” 12 July 2016. Woody Island and Triton Island in the Paracel Islands. In my next post, I’ll describe how the simulation worked.